I just downloaded Open pak 128. One of the features I like is the Private Way Entrance Gate. However, I notice that it's only available for railways and not for roads. Seems like it would actually be a bit more useful road than rail. Is there a way it can be introduced for roads in the next iteration of the pak? It's currently (not optimally) available as bollards. Thanks for your replies. Are the bollards on the pak128 roads menu (I don't recall see them there on the nightly), or are they available as a separate add-on download? They are available by default in openpak128, just next to the highway signals. The bollards are no longer there in nightly 6006. However, Vladki's road gates are much better anyway; much closer to what I had in mind. Thanks all. Either bollards and gates don't look good IMHO, unfortunately. When they are closed for you, you see the authorized player's vehicles running through them. I guess we should devise a cunning look for this signal, maybe road marks or sign in player color and a green or red light for the players allowed. 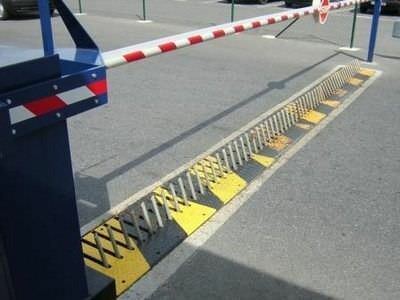 That would look a lot better than having other player's cars driving through a closed crossing arm or bollards. 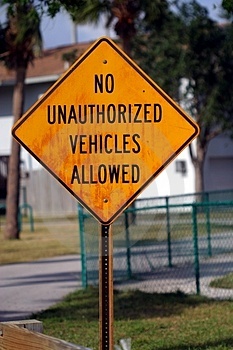 It could be something like an industrial yard type sign that indicates no entry for unauthorized vehicles and some yellow marks on the road. There could also be a crossing arm to help indicate the no-entry tile but it's always up. And what about animated gate, somehow similar to water crossings. When an authorized vehicle passes through, the gate will open for a while. Also a possibility to have a front image for the gate will be nice. How about this, minus the arm and spikes? Just some fat paint stripes on the road with player colours, perhaps?